We made this recipe starring beautiful Canadian beef tenderloin for CBC meteorologist Ryan Snoddon. It is the ideal recipe for a chilly autumn day. If it were possible for a meal to actually “stick to your ribs”, this would be the one. A genuine bracer for cold weather with plenty of energy for a working farmer or weatherman. Preheat oven to 400 F (200 C). Bake potatoes for 1 hour. Heat oil to medium high in a heavy bottom cookpot. Fry bacon for about 10 minutes and remove (drained) to a plate. Sprinkle beef with salt and pepper. Brown beef in batches until every piece is brown on all sides. Remove from pot. Add carrots and sliced onions to pot and cook for 10 minutes, or until onions are golden. Add garlic and cook for another minute. Pour brandy over vegetables and stir. Cook for another few minutes. Place bacon and beef with rendered juices back into pot. Add gravy, wine, tomato paste, pearl onions and dried thyme. Partially cover pot. Bring to a boil, then lower heat to simmer until beef and vegetables are tender. Blend half the butter with flour and stir into the ingredients in pot. Fry mushrooms in remaining butter until brown and add to pot. Simmer for 5 minutes longer. 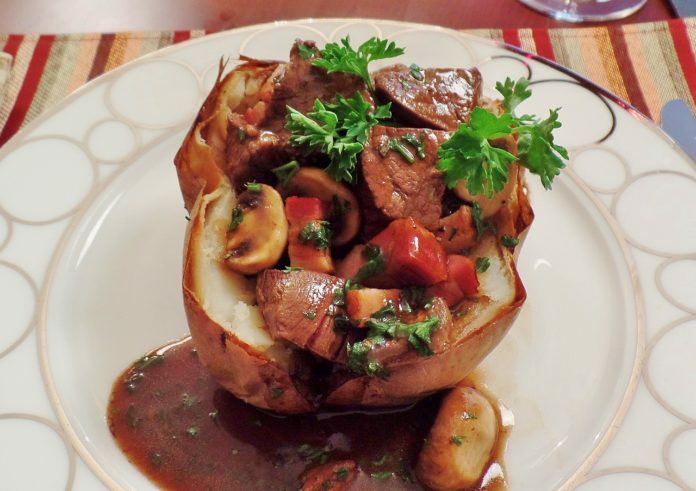 Serve one potato per person (cut in half with cut sides up) with stew poured over the potato.